LANCASTER, Mass. 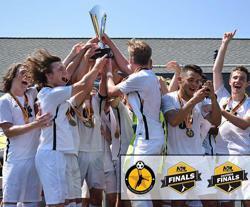 | A flurry of competition at Progin Park in Lancaster, Mass., June 29-July 3, resulted in the first-ever ENPL national championship, qualifications for eight teams to next week’s ENPL National Finals in Colorado and four NPL titles to Boys Eastern NPL Finals winners. This is the inaugural season of the Elite National Premier League (ENPL). The postseason pathway stems from a collaboration between US Club Soccer and the ECNL to elevate the youth soccer landscape among 14-U through 19-U boys age groups. Sixteen qualifying competitions – made up of NPLs and Boys ECNL Conferences – throughout the country are focused on winning their regular season competitions and advancing to the ENPL postseason, where national championships are awarded. While the 14-U through 17-U ENPL competitors participate in a two-stage postseason that began with the ENPL Eastern Playoffs and ENPL Western Playoffs this past week, qualifying teams from the 19-U division competed in a single-stage national final alongside the ENPL Eastern Playoffs, June 29-July 3. The Eastern ENPL Playoffs, meanwhile, also concluded on July 3, but for those 14-U through 17-U teams, the ultimate prize in Massachusetts was to finish in the top two of their respective age groups and claim a spot at the ENPL National Finals, July 13-14 in Aurora, Colo., where 16 total teams (eight from Massachusetts and eight from the Western ENPL Playoffs in San Diego) will compete for ENPL national championships. In Massachusetts, the NEP – NPL Division and Boys ECNL Southeast Conference were the only qualifying competitions to secure more than one representative for Colorado. Florida NPL, NYCSL – NPL Division, EDP – NPL Division and Boys ECNL Northeast Conferences will also be represented at the ENPL National Finals. In a show of parity, only one league grabbed more than one NPL championship: the Central States NPL, led by Lou Fusz SC. There is no advancement for these winners beyond their respective Eastern or Western NPL Finals. Finally, there was also a 13-U ENPL showcase-like event that was optional for teams that play into ENPL qualifying competitions. NEFC (NEP – NPL Division) edged SUSA (NYCSL – NPL Division) in the final of the 13-U bracket after advancing past Atletico FC (NYCSL – NPL Division) and Virginia Soccer Association (Virginia NPL). A full recap of the ENPL Western Playoffs and Boys Western NPL Finals will be available soon on elitenationalpremierleague.com.